This simple fix enabled IDA to properly load overlay data and analyse whole executable. I haven’t found any FBOV documentation (neither official, nor unofficial), so I can’t confirm if there are multiple different implementations of FBOV overlays. I’m rather sure that IDA DOS loader implements proper version, as someone who wrote it probably based it on some real life examples. Maybe MM3 difference stems from some unpacking quirks, who knows. I’ll not go into much details regarding process of locating decompression routine as it was neither hard nor interesting. I’ve used DOSBox debugger and set a breakpoint on int 21h (standard interrupt for handling DOS API interface), particularly interesting functions were 3Dh (open file), 3Fh (read file) and 42h (seek file). After some short period of time I was able to identify decompression routine. 1. Gathering known data – difficulty of this phase strongly depends on the complexity of the algorithm. One need to gather information about input and output buffers, all possible temporary buffers, variables used throughout the function (local and global) and last but not least constant data that might be also used during some calculations. To simplify things, all CPU registers should have assigned variable that has a name similar to the register (for example _ax, _bx, _cx etc). Type of the variable should correspond to the size of the register, in this case it would be uint16_t. In some cases it is better to represent registers as unions, so accessing 8-bit parts of registers wouldn’t be too painful. Local and global variables can be tricky, especially at the beginning of the analysis, because one doesn’t have full knowledge if particular variable is a simple type that occupies 1/2/4 bytes of memory or maybe an array. If there are multiple memory accesses at addresses that are close to each other, it is usually safe to declare such memory as an array, and later split it to separate variables if there are no array-like accesses. This advice is especially useful for local variables, so all esp/ebp related accesses should be handled through the array (let’s call it _stack for simplicity). During this phase it is very important to initialize all known data. 2. Loops identification – this is the most interesting phase (at least for me). 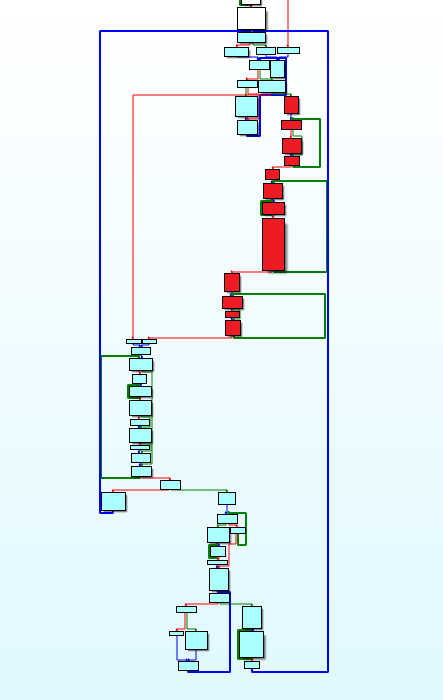 IDA‘s interactive graph-view is probably one of the best tools to execute it. It is good to start from the simplest innermost loops and move “up”. Each loop can be given a different colour and grouped. Grouping loops simplifies graph overview and hiding grouped innermost loops helps with identification of loops that are one level up and so on. 3. Code rewriting – probably the most tedious part, rewriting each opcode/group of opcodes to high level language statements, basic block by basic block. If all loops were properly identified, it shouldn’t be too hard, but as any other tedious task it is error prone. The only part of logic that left are conditional expressions, which are easy to translate to higher level languages. It is good to mark processed basic blocks with different colour to avoid later confusion (if for example whole work is split between few days). 4. Checking correctness – in most cases it will not work at first run. Mistakes committed during any of three first stages are common and hard to spot. Fixing those problems usually requires long debugging sessions with two debuggers running side by side (original code versus recovered one). 5. Code beautification – after successfully finishing phase 4 it is good to go through the whole code and finally resolve all uncertainty regarding variables, arrays and constants. It is also good to give proper names to variables and eliminate all unnecessary constructions that mimic assembly. Ideally after this phase there shouldn’t be any variables named after x86 registers or arrays simulating stack. It should look like legitimate high level code. Back to the Might and Magic III, I’ve roughly followed all steps and at the end I had a working decompressor. To avoid mistakes mentioned in point 4, I had a debugger with an original code open and I was checking each rewritten basic block if it generates the same output as the original one. I went through all compressed streams from MM3.CC and I couldn’t trigger one part of the decompression algorithm, so I temporary left it empty. 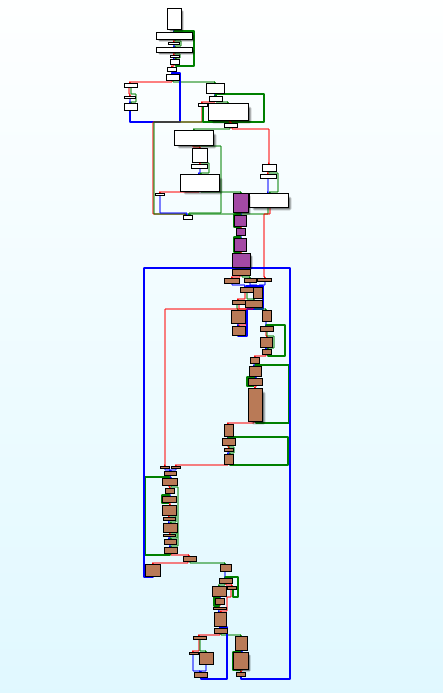 Red blocks on the below graph shows the part that is never executed for the given game files. I've found source code of an unpacker for some old Amiga file format. Except 0xFC4 constant there were also constant tables that are present in MM3 decompressor as well. It turned out that MM3 uses LZHUF algorithm (original implementation). I've used this knowledge to further beautify my reverse engineered code (based on this implementation). I've also copied missing part of the algorithm (red blocks) from this source code. MM3 version of LZHUF is identical to the original one with just small exception, instead of using default 0x20 value to initialize dictionary, it uses value provided as an argument. This 8-bit value is different for every compressed stream stored in MM3.CC file. I guessed that it might be value of the most occurring byte inside uncompressed stream and I was right. I hope all of you enjoyed this (maybe a bit too long) piece of history. Nice one ReWolf, I’m surprised DiE detected the packer. Wow ;) is it the real translation or just google translate ? Hi Revolf. A few weeks ago i have read this post. I really liked it. I have saw that you very good and skilled reverse engineer. I would like to ask you. Can you see and extract some sprites from kknd extreme game. I will make a rebuild of this game in unity 3d engine. I understand that is not simple, but if you have not time you can guide me by manuals and docs. Please write me email. We can discuss some details. ReWolf, great post and thank you for sharing the code. Unfortunately I was unable to compile it with VS2008 and VS2010. Would it be too much to ask you to upload the binaries of your dumper/packer? Hi, any objections to me porting rwf_lzhuf_decompress to java for use in https://github.com/busyDuckman/OpenXeen. I’m not 100% sure what licence openXeen will adopt. but I seek an arrangement where: A) I give you credit for the accomplishment and work related to mm3 decompression. B) I then proceed to do stuff without having to worry about licence conflicts or usage restrictions.